This article is the first in our Standard Dynasty Rankings Series that takes us through our full top 100 rankings. 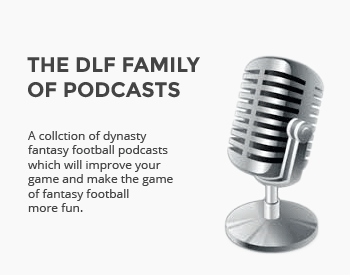 I love the DLF dynasty rankings. It’s an awesome resource and tool. Because a majority of leagues today are played by a PPR format, that’s how the rankings are made. So what should we do if we have a dynasty league/startup in standard? While we can use the PPR rankings to get a good sense of what we should do, I felt it would be better to give readers a definite list they can use as they navigate their standard leagues. Over the next series of weeks, we’ll take you through our top one-hundred standard players, so you can have a good grasp on how you should handle startup drafts, and who you should value when trading. We’ll start today with one through ten. If I were picking at 9 or 10 in a Standard league, I would have a hard time passing on Fournette. Remove PPR from the equation and I think Fournette has a 5-3 TD ratio above Hunt and Kamara over the course of their careers. 6 pts per TD is huge in Standard leagues, even if Hunt and Kamara out gain him in yards from scrimmage. Based on 2017, I can see going with Hunt/Kamara. LF had 10 TDs (9 Rush) in 13 games to go with 268 carries and 36 Rec. Hunt had 11 in 16; Kamara had 13 in 16 games. But looking forward for next 6-7 years, LF would be my guy at the end of round 1. Hey Leo, thanks for the comment, I can tell you really know your stuff! Fournette was definitely somebody I thought about putting in the top ten. As you eluded to, he should be a tremendous goal-line back throughout his career. But through my research and projections, Kamara and Hunt both proved to be a bit more promising. I could obviously be wrong, it’ll be so interesting to see. I’m with Leo on this one. Fournette’s only real worry is the ankle. If not for that, he’s probably ahead of Saquon in standard leagues. At least until the Bark man does it on an NFL field for a season. Fournette’s in an old school run 1st offense wherein the team doubled down on their investment in the offseason. Letting both A-Rob & Hurns go tells me all I need to know about the Jags commitment to run, run, run. As long as his wheels hold up, Fournette is going to continue getting 25 touches a game. But this is why FF is so fun. Everyone has their own convictions. Best of luck! Hey Johnny! Thanks for the comment. I think you make some great points, and I definitely would see the merit for Fournette getting a top ten ranking. But I just couldn’t manage to put him over Hunt or Kamara, who both were absolutely terrific last year. I will say though, if Fournette can improve in year two, I’ll have no problem moving him up! Bradley, I have great respect for your work. Keep it coming. Keeper Question for you. I play in not a true Dynasty League, but an extreme Keeper League. We score 1/2 point PPR and 1/2 point for rushing or receiving first down, so RB’s and running QB’s are more valuable. We can keep as many as 12 players from a roster of 26. We start QB, 2 RB, 2 WR, TE, 2 RB-WR-TE flex, and 1 Superflex. The first 11 keepers are easy for me, I think: Russell Wilson, Marcus Mariota, Kareem Hunt, Alvin Kamara, Jay Ajayi, Kenyon Drake, Derrick Henry, Nuk Hopkins, Tyreek Hill, Amari Cooper, and Evan Engram. Who would you keep as #12 between DeVante Parker, Jamison Crowder, Marquise Lee, or Tyrell Williams? Barring injuries, this 4th WR will not likely see much action in 2018, so I could possible go for a player (like Williams) who may have best long term projection if he gets on the right team in 2019. Or, am I just overthinking this? Should I just take Parker, even though he has been so inconsistent, because he seems to be a lock for 100+ targets? Crowder is the safe but boring choice choice–and I prefer more upside. But I fear Parker may be too risky and Williams needs a lot to happen to get the targets he needs. Lee has potential, but he’s my last choice of the 4 now. Who do you like best and why? Thanks in advance. Hey Leonard! Thanks for the comment! Absolutely love your team by the way, just like you said, you’re first 11 keepers are slam dunks. As for the twelfth player, for me, it really comes down to Jamison Crowder and Devante Parker. I think those two have a good edge over Williams and Lee. Between Crowder and Parker, you really can’t go wrong. Both twenty-five years old, both have had promising yet marginal production thus far. Even more so, neither have had major injury issues, and neither are in fantastic situations. Such a tough one. I’m leaning Crowder, but only barely. The nice thing is, as I said, you can’t go wrong. My official advise would be Crowder, but going with Parker is far from a bad option. Thanks again, Leonard! I hope this helped! Awesome article, thank you for posting relevant stuff. I am in a trade debate right now over moving Adams, Michael Thomas for Nuk and Carr. Superflex and can only start 2 WRs so after trade I would have Nuk, Amari, Dez with QBs Jameis, Garropolo and Carr. Would you make the deal or stay with the depth at WR I have now? Hey Mark, thanks for the comment, great question here! Carr is obviously a very valuable piece in Superflex, but I don’t think you’d be getting the better end of this deal. The combination of Adams and Thomas is absolutely lethal, and I don’t think you should move either of them unless you get a great offer. It’s certainly not a horrible trade, but my advice would be to decline it. I hope this helps! Thanks Mark! Hey Leonard! Thanks for the comment. Funny enough, I actually wrote an article for a Standard scoring rookie mock. It was posted in early May but I still feel good about the selections. I will leave the link below. I Hope this helps! Let me know if you have any further questions! Thanks Leonard!